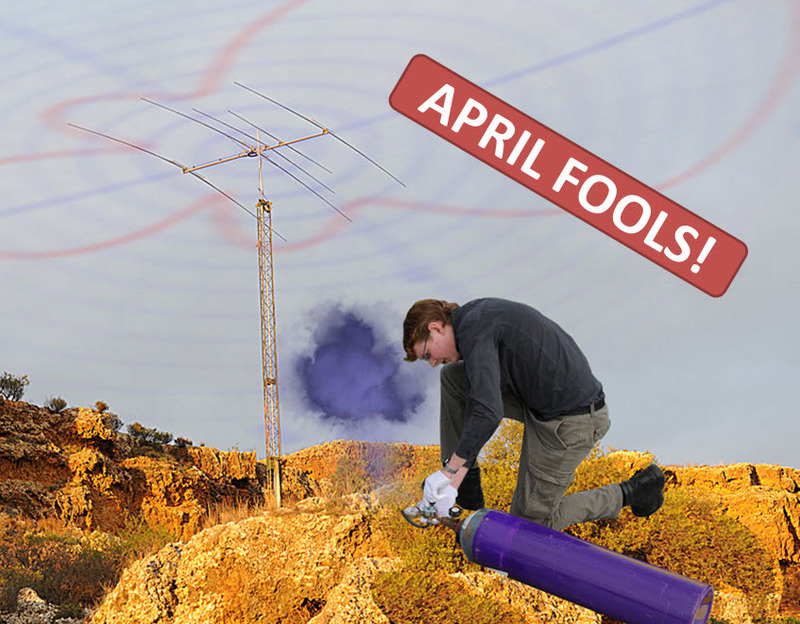 The Amateur Radio Experimenters Group, one of Adelaide’s leading Amateur Radio groups is pleased to advise that after months of research and experiments at a secret location, it has developed and perfected a process whereby the radiation pattern of any HF antenna can be displayed visually, full size in real time. The kit includes a canister of particles which are sensitive to E and H field radiation. The particles are suspended in harmless nitrogen gas which, once released near an antenna will align to show you the radiation pattern of that antenna whilst it is transmitting. When the particles are charged by the E and H field radiation they become opaque, arranging themselves along the lines of maximum intensity of the emitted electromagnetic field. The end result is a real time ‘Smith Chart’ like representation of the Antenna radiation pattern. The deluxe version of the kit uses a laser, guided by a PC controlled mirror arrangement, to display a grid pattern for calibration purposes, which will allow you to take a photograph for storage and future analysis. A patent application has been prepared for lodgement, after which time the proposal will be presented at the April Monthly meeting. Kits will be funded through the “StartKicking” process in due course.